Since Redis was written in ANSI C, most POSIX operating systems handle it properly. We have a version for OSX, Linux, and BSDs. Microsoft also supports a ported version of Redis for Windows. On a Linux System, Redis can be installed using the commands below. This downloads the latest stable build from Redis website, extracts the tar file, and compiles it. On a Windows machine, the prebuilt version can be downloaded from the MSOpenTech GitHub page. After installing Redis, a new CLI will be available. 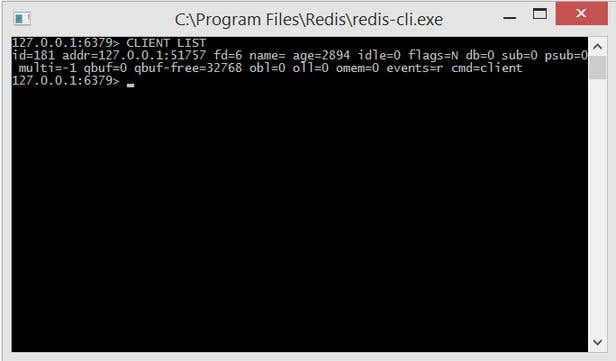 When starting redis-cli and typing in the CLIENT LIST command, it should list all the active clients for the Redis server. What can I store in Redis? Redis can store a wide variety of data structures, from strings to lists of strings, sets, hashes and bitmaps. The keys for the values can be anything starting from strings to byte values or contents of a jpeg file, because the keys inside Redis are byte safe. The code below creates a client to the redis server and sets up an error handler so we know what errors occurred during the execution of the script. Then we define a key for storing a simple string, SIMPLE_VALUE_KEY. As a best practice, redis keys should be composed using a composition of model hierarchy and colons. Next we set the Value1 assigned to the SIMPLE_VALUE_KEY. After setting the value we try to get the value from redis using the get method of the redis client. The get method’s second parameter is a function which has two parameters: the first is the error object (of course if there were errors), while the second parameter is data read from redis for the given key. Similar to storing simple values, the concept needs to define a key. The next step is to create the array (myPrimes) which we want to store. The next line applies the rpush method of the client for each element of the myPrimes array. The lrange method can be used to load the array/list elements from redis to get the key as first parameter. The second and third parameter stands for the start and end index of the items from the list. In this case, 0 and -1 signifies that we want all the elements from the list. We can use the del method if we want to clear out values assigned to a key. The method shown above receives the key and a callback function. The result variable will contain the number of deleted items from redis.